The 3Shape TRIOS Ready program connects dental practices and labs making it easier to share scans and discuss cases. We find more and more dentists are choosing the TRIOS intraoral scanner. To be accepted as a Trios Ready laboratory we went through a case from initial scan to the final restoration. We had to prove to 3Shape that we understood the process and can produce a quality finished crown. We have now been added to the small list of Trios ready laboratories in this country. 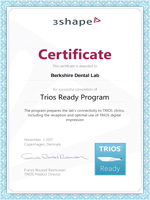 To see the full TRIOS Ready Program certificate, view it by clicking on the certificate image. One of the 3Shape representatives came to visit us at BDL and said he was very impressed with our work. He announced the crown we produced was one of the finest crowns he’d seen created from an intraoral scan! If you would like to send us a case, you can contact us through 3Shape communicate or for more information please give us a call on 01189 97 97 555. Or find more information on the TRIOS Ready Program.